This World Heritage Site is an exceptionally well preserved example of architecture that goes back as far as the 10th century. Guimaraes was originally the first capital of Portugal and today it is one of the country’s most historic cities. 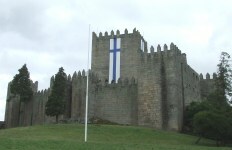 The main attraction would have to be the medieval Castle, built to protect the town’s people from invasion by the Moors, as back then most of southern Spain and Portugal was under Arab occupation. The first king of Portugal, Afonso Henriques, was actually born in Guimaraes in 1109AD and baptized in the small chapel next to the Castle. It was he who extended the Castle during the 12th century to what you see today. Leading down from this fortress to the historic part of town is the Rua de Santa Maria, a street which is still very much the same as it was all those centuries ago. Many of the historic buildings that line it have been restored to their former glory, such as the 16th century Baroque Convent Santa Maria and the Casa dos Carneiros, an ancient noble manor house. At the end of this street are two charming squares with traditional houses very typical of northern Portugal. The Largo da Oliveira square is named after the old olive tree in the square itself, and is dominated by the impressive Church of Nossa Senhora da Oliveira. Here you will find several outdoor cafes and the original old Town Hall. Formerly a manor house the Pousada is a small luxury hotel with lovely views of the square. It has been furnished very much in keeping with the period which is a big part of its charm and has a restaurant serving traditional Portuguese cuisine. Guimaraes has many lovely churches but the Sao Francisco Church is one of its finest. Built in 1400, it was originally a Gothic design but later restored during the 18th century with the addition of an elegant Renaissance cloister and fountain. Another interesting building to explore is the 15th century Palace of the Dukes of Braganca, or otherwise known as Paco Ducal. Influenced by the great French manor houses of that period it is quite unusual with its 39 brick chimneys. Inside there is a very impressive banqueting hall and with furnishings that date back to the 17th and 18th century. There are several museums in the city that are worth visiting, but two that should not be missed, is the Alberto Sampaio Museum with an excellent exhibit of religious art. Its greatest treasure is the tunic worn by the defeated King in the Battle of Aljubarrota in 1385. The second museum is the Martins Sarmento with fascinating artefacts from the Celtic settlement of Citania de Briteiros. The settlement itself is only 9km from the city and dates back to 300BC. It was first discovered in 1875. There are the foundations of more than 150 stone huts and is now open to the public, with two of the original huts restored to their original state. In the village of Briteiros there is also an Iron Age museum called Castros where you can look at some of their findings, which include fragments of painted pottery, jewellery, and weapons. Guimaraes has the privilege of claiming it has two Pousadas, the second being a 17th Century Augustinian convent now beautifully converted into the luxury Hotel Santa Marinha. Located on a hill just outside town, it is considered one of Portugal’s finest Pousadas, and was awarded the Europa Nostra prize for its renovation and restoration. With its vaulted ceilings and lovely gardens, this stunning hotel also offers fine cuisine with a selection of local and regional specialities. If you are visiting during August, the city comes alive with a Festival of Medieval Art and Costume, which has been taking place since the 15th century and includes a torchlight procession and medieval parade. But with so many exciting activities in the area such as a shooting range, golf, horseback riding, mountain biking and micro lighting there is a great deal of fun to be had whatever time of the year you go. 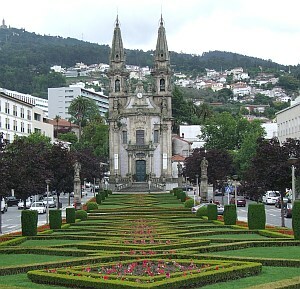 Braga and Porto are also within easy reach and both would make excellent day trips. Porto is also the nearest airport however, and with so much to take in once you get there, perhaps you may be tempted to finish your holiday with an overnight stay.